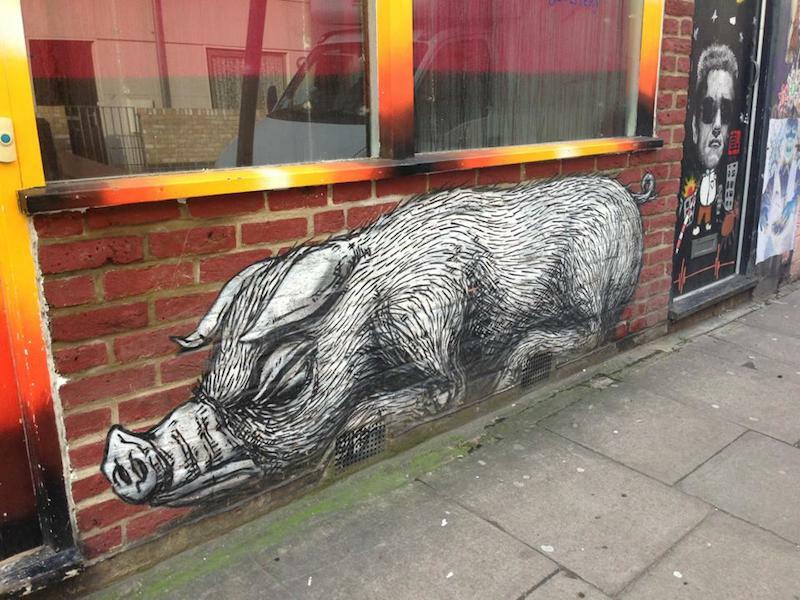 Roa in London. Photo by Leigh Harries. Belgium’s premier street artist, Roa has been posting photos of his work online since at least April 2006. While he was painting outdoors long before that, it was in 2009 that he finally began to receive significant attention outside of Belgium for his work. Now, he is one of the world’s top street artists and the only Belgian artist to be included in the 2011 show Art in the Streets at MOCA in LA. Roa’s murals are much-loved around the world and so there is little doubt that the man can paint a good mural, but it was the internet that helped him to go from being a local artist to an international star. Although Ekosystem has posted Roa’s work since 2007, it was on Wooster Collective where I first saw it. When Wooster Collective posted a photo of one of his pieces in Brussels in January 2009, I was surprised I had never seen Roa’s work before. Tracking Roa down proved difficult. He had a Fotolog account (a site similar to Flickr). On Fotolog, you had to pay to comment on photos unless you were one of the first people to comment on a particular photo. Every day for nearly two weeks, I checked Roa’s Fotolog to see if I could comment for free. On January 21, I posted a comment and asked him to email me. I heard back later that day. In March I posted about Roa. By then, he had visited New York City and painted at Factory Fresh and Secret Project Robot. Those walls caught people’s attention. Soon, Roa’s work was appearing regularly on Flickr accounts like that of Katherine Lorimer aka Luna Park’s and blogs like Wooster Collective, Vandalog and Unurth. While I am not even close to being an objective observer in this case, I did watch the growth of Roa’s career. It is my very biased opinion that those three blogs in particular championed him in front of a large enough audience that our support played a significant role in his growing popularity. Once you see a wall by Roa in person it’s clear why he now receives many opportunities to paint at festivals and exhibit in galleries. But he was doing work that was just as interesting back in 2006 and not getting those opportunities. Outside of Belgium, few people knew him. Blogs introduced Roa’s work to an audience beyond those who could see his murals in Brussels or at abandoned factories outside of Ghent. A piece by Roa, just off of Brick Lane. Painted in October 2009 during his trip to London for a show at The Brick Lane Gallery. Photo by MsSaraKelly. It helped that Roa visited major art cities like New York and London. He visited London in October 2009 when he had a few small drawings and two wallpaintings in a show at The Brick Lane Gallery. During that trip, he painted around half a dozen pieces either on or within a very short walk of Brick Lane, the epicenter of London’s street art scene. 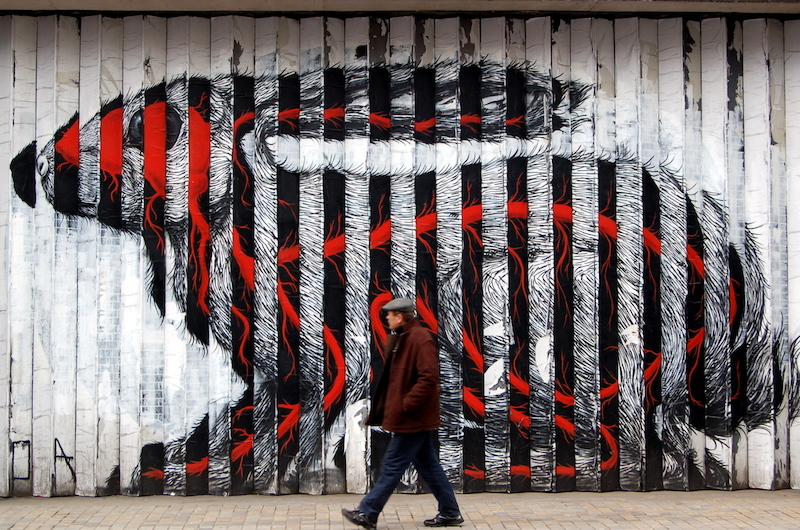 By the time he left town, everyone in the London street art community was talking about Roa. The following April, Roa had his first solo show at the Pure Evil Gallery, a gallery owned and managed by Charles Uzzell-Edwards aka Pure Evil, a street artist who collaborated on a wall with Roa during his October 2009 trip. Roa loves to travel. He has painted across Europe, North and South America and Australia. All along the way, he finds new fans and makes work unique to each location, but he also allows his fans at home to appreciate his work by taking good photos and distributing them online. While Roa’s success cannot be entirely attributed to the internet, his combination of skill, travel and web-presence all contributed to his popularity.